There are many radiation shielding products to choose from and it can be confusing trying to understand if any are effective. It can also be dangerous if you select the wrong product for protection. 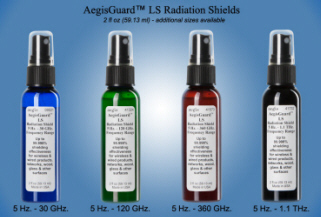 It make sense to protect yourself by using #1 doctor recommended AegisGuard™ LS Radiation Shields, the same personal protection radiation shields use worldwide since 1988 for hundreds of Shielding Applications by the military, industry, hospitals, and individuals suffering from the effects of electrosensitivity. Think about the following paragraphs when considering low SAR phones or shielding products tested using SAR thermal measuring procedures or test instruments, and you will understand why Aegis was the first company to publicly announce that thermal measurements (SAR) should not be used as the criteria for determining radiation safety. Aegis is also the only manufacturer of radiation frequency shielding products that deflect, or reflect, the frequencies away from the body at an angle opposite of the originating source, and the only products tested at actual radiation frequency levels for extended time periods. Click here for additional SAR information. SAR safety standards are used to determine the "estimated safe levels" of cell phone and other radiation that a person can be theoretically exposed to without harm. The standards accepted and referenced by the U.S. FCC and other regulatory agencies worldwide are based upon the results of a study conducted by the United States Air Force Research Laboratory (AFRL) in 1986. Simply stated, the scientific methods used by AFRL to define "estimated safe" temperature (thermal) absorption rates for body organs exposed to cellular phone radiation frequencies are based upon measuring the rectal temperature of an adult male positioned in direct sunlight for 30 to 60 minutes. You can download the study in pdf format (5.8 MB) by clicking here and review all 11 chapters of technical information, or concentrate on Chapter 10 to learn how the current SAR safe thermal standards were determined. Don't be misled when reviewing shielding effectiveness claims, particularly when a product's test results are presented as a SAR thermal reduction based upon tests using equipment or low cost meters designed to measure temperature (you can easily determine this if the test results are expressed as mW/cm2). Equally as important, find out how long the tests lasted, the number of products tested and if the products were tested at frequencies above 1 GHz. AegisGuard™ shielding tests are conducted by Aegis and three independent testing laboratories using products, homes and offices for the amount of time they are used by people and businesses. Each AegisGuard™ LS shielded handheld and body worn product is tested for at least 8 continuous hours, washable clothing and fabrics shielded with AegisGuard™ LL for 24 hours, and homes and offices shielded with AegisGuard™ LP for 1 year. Higher frequency tests between 5 Hz. to 1.1 THz. are conducted using MIL-STD-285, IEEE-STD-299, MIL-STD 285, IEEE 802.11 (current & proposed), and ETSI EN 302 567 standards. If standards do not exist, CPE (Customer Premises Equipment), PSG vector signal generators, and network analyzers With millimeter-wave controllers and frequency extenders are used. Aegis was the first company to advise its employees and customers about the risks associated with using wireless radiation shielding products claiming to absorb radiation, and AegisGuard™ Radiation Shields are still the only shielding products available to consumers proven to deflect radiation frequencies. In 1999, the World Health Organization advised consumers not to use cell phone radiation shields incorporating absorption technologies, as does every phone manufacturer. Click here to learn why products claiming to absorb radiation, including cell phone radiation, cannot possibly be effective. The foundation of the Wireless RF Controversy is the effect of the non-ionizing radiation frequency element of electromagnetic radiation emitted by products and upon our health. Available as chips, pendants or small adhesive devices attached to wireless phones and other electronic devices, these products claim to “harmonize” or “neutralize” the negative effects of electromagnetic radiation upon the body by generating a resonant frequency which is either permanently infused in the product or powered by the human body. A review of the available product information clearly indicates the only portion of electromagnetic radiation being addressed is the magnetic field, rather than the electric field or non-ionizing near field wireless operating frequency radiation which has been linked to more than fifty health effects attributed to cellular phone use. Click here for additional information about magnetic fields. Stress level reduction, improved concentration and enhanced energy are benefits these products claim to provide and while some studies suggest altering a magnetic field using therapy, magnets or other devices may improve how a person feels, none of these claimed benefits any correlation with the health effects attributed to wireless or wired products. Several studies have confirmed cellular phone use actually improves cognitive functions and while there have been many studies linking long term power transmission line and transformer magnetic field exposure to diseases such as leukemia, it has never been determined if these occurrences are due to magnetic fields or non-ionizing radiation frequency emissions. The U.S. Federal Trade Commission filed charges on February 20, 2002 against two companies selling these types of products, stating "the vast majority of electromagnetic energy emitted by cellular and cordless phones comes from parts of the phone other than the earpiece." In May, 2003, two companies were barred from selling these types of products in the United States, and it should be noted these types of products were previously banned in many nations. Click here to learn why the FTC is correct. Every cellular and cordless phone manufacturer warns consumers not to interfere with a phones antenna. It should be noted that AegisGuard™ LS Radiation Shields does not affect, or interfere with, an antenna's operation. Any device (including flashing devices for children) designed to interfere with an antenna will cause a phone to increase output power and, some products including signal boosters, are a health risk. These products normally consist of one or more pieces of metal that may be enclosed in a phone case, attached to the battery, or back of a phone. When a phone is in use, the metal used in these products absorbs radiation and emits a radiated field the same size as the device towards the point of least resistance; specifically the head or body. Click here for additional information. With increased frequency, reports have been published since mid 2001 addressing concerns about low level radiation emitted from a phone's components, such as the battery or display, which are not required for cellular communication. AegisGuard™ LS and XP Radiation Shields support an extremely wide range of frequencies and power levels were initially developed for a wide frequency range of military applications and they are perfectly suited to provide protection from operating frequencies between 5 Hz. and 45 GHz. if these concerns are proven to be justified. Excluding AegisGuard™ LS and XP Radiation Shields, body style and personal radiation shields promoted for these applications by other companies contain an absorbent or conductive shielding material which is not designed by the manufacturers to protect against cell phone radiation, particularly at frequencies above 1 GHz. Click here to learn more about the importance of AegisGuard™ deflection properties. These products have a small plastic tube that separates a headset wire from the earpiece and when revealed to the public, their test results are normally presented as SAR reductions determined using short duration SAR test procedures. Although the temperature (thermal measurement) at the earpiece is reduced due to the elimination of the headset wire, just as thermal SAR emitted by a cell phone declines over distance, they offer no additional safety when compared to conventional wired headsets. Most ferrites function at frequencies between 1 KHz. to 1 GHz. and it is important to understand that cellular phones operate at frequencies above 1 GHz. Ferrites are commonly used on 50 to 60 Hz. AC power cords and in the circuitry of electronic equipment to prevent unwanted outside radiation frequency interference (RFI), also known as noise, from penetrating the wire and interfering with other components within the equipment. Ferrites are not designed, or intended, to be near the body and are never used for shielding people because their electromagnetic absorption properties are significantly affected by environmental and operating conditions, including temperature, pressure, field strength, frequency and time. They do not provide any protection whatsoever from cellular phone radiation when using a headset because they can only prevent radiation frequencies between 1 KHz. to 1 GHz. from entering the wire, thus having no effect upon the frequencies traveling up the wire from a cellular phone. Ferrites are widely used in the electronics industry because in addition to their low cost (less than US $1.00), they also offer high magnetic permeability that concentrates and reinforces the magnetic field and high electrical resistance, thus limiting the amount of electric current flow in the ferrite. Their specifications are always presented as resistance (in OHMS) and since they cannot limit the amount of radiation flow, they are never used for any applications where a stringent degree of component radiation shielding effectiveness is required. Wireless headsets replace the wire normally found on a headset with a transmitter and receiver. They can represent a greater health risk than a wired headset, particularly when their 2.4 GHz. frequencies are within Bluetooth, 3G, 4G and 5G operating specifications. In addition to the wireless headset frequency entering the ear canal, the earpiece attracts higher frequencies generated by the phone and from the air that surrounds all of us.